With the ever-growing genre of shooting games, one has to wonder why we don’t see more hunting games filling up the game aisles? Sports like basketball or soccer get several games a year based on them, while you’ll be lucky to see even a few hunting games released in the same timeframe. Thankfully, Cabela’s The Hunt: Championship Edition is here to give hunting fans something to enjoy during this dry spell. Its been years since the abundance of hunting games on the Nintendo Wii, so let’s see if this one will fit right at home with the new age of consoles. We would like to thank the wonderful people at Planet Entertainment for providing us with the game bundle. If you have played any hunting game before then you already know how the game plays. You have a selection of tools to aid you on your hunts such as your guns, crossbows, ATV, GPS, and so on. You can track animals by finding markings they left behind, and you can hide in certain spots and wait for game to walk in your line of sight. Activating Stalking Mode allows you to slow down time and gives you Predator infrared vision to make it easier to spot and sneak up on animals. There are ten different locations in this game you can hunt in, though some of the maps aren’t really that big. Your character moves as slow as molasses, so you will need to stay close to your ATV to move about the game world with speed. The GPS is a multipurpose tool that lets you see the map, in-game leaderboard, and other useful features. When you start the game you get to choose your own character, though beyond your hunting tools the customization is very limited. From there you have a few modes to choose from. Seasonal Hunt is the story mode of this game, where you travel to different states competing in a tournament. Here you’ll learn the basics of the game, play fun mini-games, and earn reputation to unlock the next state. In Free Hunt, you get to hunt without any limitations or rules, and without the pressure of a leaderboard. Finally, you have Mini-Games, which is the sole multiplayer experience in this title. While these small diversions can be fun to mess around with, I’d have preferred a full-fledged co-op tournament mode so you and a buddy could go hunting together. This is a huge missed opportunity, especially when you consider the Switch is the perfect console for local multiplayer. The game does provide a fun hunting experience, but one of the biggest problems is that the graphics just aren’t that great. Sadly the visuals of the game look only slightly better than what you’d expect to see two generations ago on the Wii. We’ve come to expect some spectacular visuals from the Switch, and it’s unfortunate more time wasn’t spent in polishing up this title. The game looks decidedly last-gen, not only in visual fidelity and graphical complexity, but also in terms of map size and world building. How cool would it be to play a hunting game in a game world like we’ve seen in The Legend of Zelda: Breath of the Wild? Sadly you won’t find anything close to that here. Instead you’ll find some muddy textures and it’s so bad that sometimes it’s difficult to tell where you can and can’t travel in the game without using your GPS. I have gotten my ATV stuck several times while playing the game due to invisible walls being placed on hills and other areas that seemed perfectly fine for traversal. Despite the lackluster visuals, the game does a nice job at creating atmosphere. There are some music tracks that play in menus and mini-games, but while hunting all you hear is the call of the wild. Each area features the sounds of the fauna and local ambiance that you would find in that local spot. Some effort was put in here and you most likely won’t just hear the same bird chirping on loop over and over again. While a great soundtrack can add to the quality of a game, sound design is at its best when developers know when to dial back the music and let the sound effects take over, and that’s the case here. Cabela’s The Hunt: Championship Edition makes full use of the Joy-Con controllers. If you buy the physical bundle of the game, then you can get your hands on the Bullseye Pro Rifle peripheral. If you are going to play the game with motion controls then I really recommend playing with the plastic accessory for better immersion. The peripheral is decently sized, around 22 inches, so it’s much more comfortable to hold than the small Joy-Con controllers. The motion controls for the game are as good as you would expect, and they work just as well with the peripheral. The game is built for replayability, with several locations to explore and over 20 species of game to hunt. Though it’s worth mentioning that in a few months after this review the game will be hosting online tournaments. Here you should be able to play against other players in the online leaderboards for real prizes, such as free gift cards and other items. While there is no news of downloadable content for this game, the online tournaments are a real incentive to get back into the game every so often to put your hunting skills to the test against other players. Cabela’s The Hunt: Championship Edition is a worthy attempt at a hunting game on the Switch. Despite the lackluster visuals and a missed co-op opportunity, it has everything you would expect from a hunting game, as well as a high quality of atmosphere that you would not suspect from just seeing a few screenshots of the game. Even though the hunting genre is scarce on the system, it’s safe to say that this one is worth your attention. Hunting games were a dime a dozen on the Wii, but they’ve been MIA on the Switch. 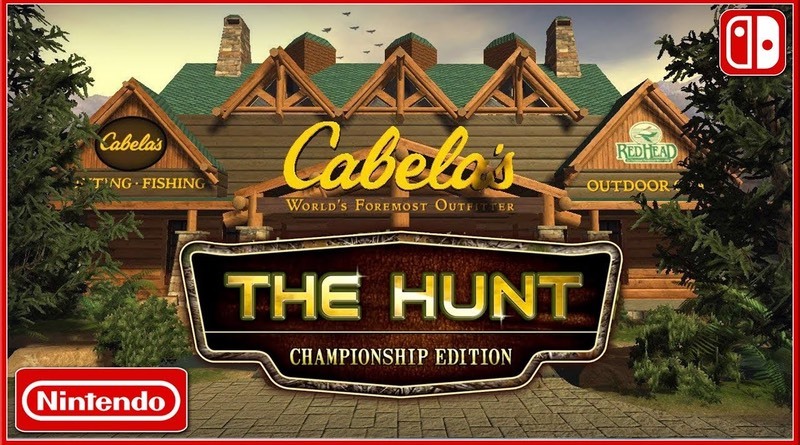 Cabela’s The Hunt: Championship Edition is a good choice, with varied environments and a fun campaign to play through. Jordan is a gaming fanatic who grew up in a home of shovelware. Years of discounted drivel has molded this man, shaping him into the seeker of quality he is today.